Hy, tks for the info. Since j known that JPG format is loseless anche each time you modify the photo when it is saved some data was loss, one important question is : rewrite/update metadata field on JPG with EXIV2 library *always* preserve the photo as-is, or sometimes is possibile (for example to extend metadata area, ….) the photo have to rewrite with new compression method (and so loss some graphic data) ? 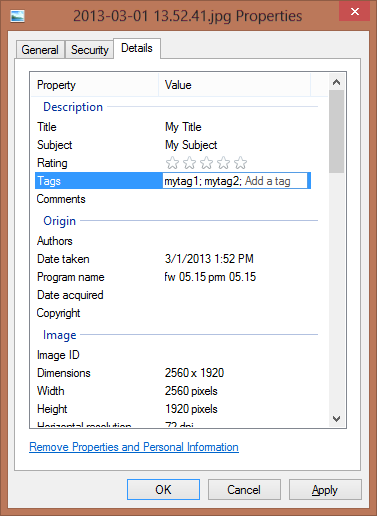 Hi, I too use Windows Explorer to view and edit my tags. I increased the size of the window in the bottom of WE so I could see more configuration settings. There you can click on the Tags line and type in what you want. You can still select multiple files too. There are no other windows to open and close, like you do it, so it is faster. I looked and see that there is a “Details pane” that can be enabled in Explorer, which I assume is what you are referring to. This definitely seems like a better way to do it. Thanks for pointing this out.